Maplewood City officials are set next week to take the final vote to allow two valet parking spots (the original request was for four) on Sutton Boulevard next to Elmwood restaurant; the valet service kicked off on Tuesday. A young man stood ready to park customers’ cars outside Elmwood Tuesday evening. He said he was an employee of Clayton Valet. He took cars to the Marietta parking lot, where a section is reserved for the use, or the Schnucks lot, he said. Signs designating four valet parking spots are already posted. The Maplewood city manager said they’re temporary until the final council action. 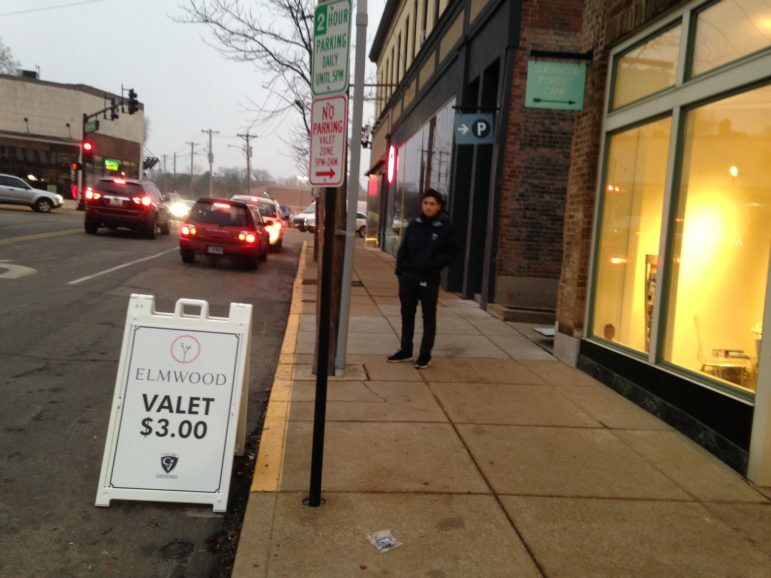 An employee of Clayton Valet stood ready to park Elmwood customers on Tuesday. $3 per car to park them is not enough for me to stand out there on the sidewalk to park cars with the weather we have had the last couple of days. I am guessing they picked $3 and figure most will give you a $5 and tell you to keep the change. Still not enough in this weather. As far as parking to begin with. We do have the free parking lots. Maybe the sign should be something like 15 or 20 minute parking. And if you have a relative that has trouble walking I would guess you could park your car there for that time, get your relative seated, then go move your car to a free parking lot. When it is time to leave you go get your car, park it for 15 minutes, go get your relative, put them in the car and off you go. I thought a huge plus of Maplewood is how walkable it is to get around. So those who can could walk to to and from the parking lots. I 100% agree, Mark. That sounds like the most pragmatic solution. Aren’t all of our parking lots FREE? Someone in the party could drop everyone off, go park, and walk back, and it wouldn’t cost $3! Tell me the name of a Sutton business that needs those parking spaces from 5pm to 2am? Name one. Nova Salon from 5-9. I’m a customer of Nova salon. The Muddled Pig, Saratoga Lanes, Maya Cafe, Wellbody. There’s a good number of businesses open past 5 there. What!? No! That’s one of our favorite places to go. Always had great food, friendly staff the best happy hour in town. I hate to hear this. Do you know when their last day is? Just panicked and called the Muddled Pig. They tell me they are not closing. Amber, who is your source? Tiffany’s Diner right there on the corner, open all night. The need for a valet here boggles my mind. There are two huge lots like 100 feet from this place. I’d agree with that–but given the target audience for the restaurant (or what I assume it is, anyway), I suppose I can see why it’s offered. I feel the same way–but I think that aligns with the type of restaurant experience they’re trying to build. And then there is my mother-in-law who shattered her ankle years ago and is in pain walking while my father-in-law recently had his hip replaced and is ordered to use a walker during healing. What if they want to go out to eat but would have trouble to walk any sort of distance? How does she go to other restaurants in the neighborhood? I am glad it is there for her, but again, I believe the valet is there because they’re trying to provide a top end service level experience. Which is fine, but I can see why it would draw frustration form nearby business owners. They don’t go to other restaurants for the most part. Only drive through. can i valet and go to the Post? That’s funny, Phil. Good one.